Buffet Rack Chafing Stand 2-Piece Set Just $17.99! Down From $30! You are here: Home / Great Deals / Amazon Deals / Buffet Rack Chafing Stand 2-Piece Set Just $17.99! Down From $30! Amazon has this Buffet Rack Chafing Stand 2-Piece Set on sale for just $17.99 down from $29.99 PLUS FREE shipping with Amazon Prime or for orders over $25! Get ready for your next big celebration with Sorbus Buffet Racks. These incredibly handy set of 2 buffet racks are the perfect space-saving accessory for any party. They are the essential party supply accessories for serving food at event halls, buffet stations, party venues, or for off-site catering. 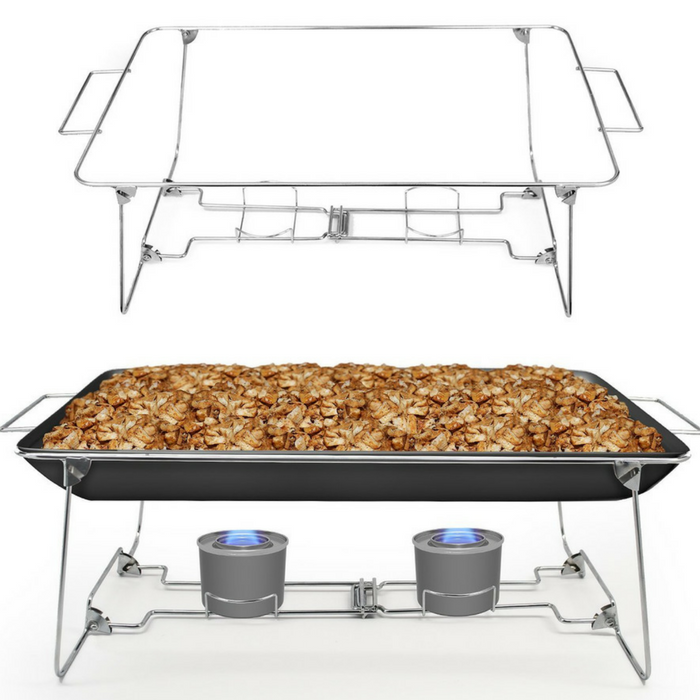 Each buffet rack is uniquely designed to safely elevate one full size steam pan or two half size steam pans above the table while serving food. Using these buffet serving racks means you never have to worry about your pans getting damaged or your food burning the serving table. The great concept about these chrome wire buffet racks is that they can be used over and over again! Even after the party is over and you have thrown away the used pans you can save these racks for the next event.